The new Italian government has the same people in key positions that it did four years ago. The economy will be in the hands of the controversial Giulio Tremonti and the responsibility of organizing it in those of the even more debated Roberto Maroni. It could be guessed that Berlusconi is trying for a miracle like that achieved by Spain’s José María Aznar between 1996 and 2004. And this not with cement and more immigrants. He will try to use nuclear energy and liberal reforms, says the author. Will he succeed? (From Madrid) A RADICAL SECTOR of the leftist Italian government has on its way out waved goodbye with an act of cyberterrorism that will be historic: it published on the Internet the rent contracts for every citizen in the country. Although they were only posted for a few hours, they were widely spread, copied uncontrollably, and what is worse, they are subject to manipulation and distortion by interested parties. This has been the only dissonant chord in the arrival of Silvio Berlusconi’s right wing government. However, it is indicative of where the next legislature will be aiming its shots: the left applied negative pressure during its four years in power and holds that it is the only way to end an enormous fiscal evasion that drains state deposits. The right promises to lower taxes, denying that fiscal evasion is so high, and in a way justifying it with the lack of control over state expenses, inefficiency of public administration, bureaucracy, and the need to reduce the budget of an overextended machinery. During his electoral campaign, Il Cavaliere set his priorities as re-stimulating economic growth, supporting measures for families, fiscal actions in favor of businesses, decreasing unemployment, and fighting against fiscal evasion. On May 8th, the new government was sworn in. Silvio Berlusconi, the victor in last April’s legislative elections, formed a government with 21 ministers, nine of which are without special designations. “Alongside Maroni, the leader of the Northern League, Umberto Bossi, was designated to the ministry of Federalist Reforms without special designation despite his health problems, which hinder him in walking and speaking”Gianni Letta, Berlusconi’s right-hand man and the real man behind the curtain in the new conservative government, was appointed as sub secretary to the president of the Board of Ministers. The list is presided by Franco Frattini as minister of Foreign Relations, Giulio Tremonti as Economics Minister, and Roberto Maroni in the Ministry of the Interior. These three strong personalities already made up part of the government of 2001 to 2006, and now return to occupy key positions. This continuity is absolutely Berlusconian. The illustrious Silvio returns with the same members with which he was defeated in 2004. Tremonti, known for his skeptical positions on European monetary policies, was Economics Minister from 2001 to 2004, and since the end of 2005 to the middle of 2006. Frattini was a european commissioner for three years and owes his political career to Berlusconi, who took him on as chief of diplomacy. Maroni, an able politician of the Northern League, occupied the ministry of Labour from 2001 to 2006. “The Northern League has acquired two minstries with special designation and two others without special designation, the same as the National Alliance, whose leader in addition has been named President of the Parliament’s Lower House” Alongside Maroni, the leader of the Northern League, Umberto Bossi was designated to the ministry of Federalist Reforms without special designation, despite his health problems which hinder him in speaking and walking. Roberto Calderoli was appointed as minister without special designation for the Simplification of Laws. Calderoli is also of the Northern League, and in 2006 was forced to resign as minister of Reform after having worn a T-shirt with anti-Islam slogans that caused protests in Libya which resulted in 11 dead. Libyan authorities warned that naming Calderoli would be catastrophic for bilateral relations, a subject which Italy considers to be of a strictly internal character. The League will also have the agriculture portfolio. The Northern League has acquired two ministries with special designation and another two without special designation. This is identical to the National Alliance, whose leader, Gianfranco Fini, has also been named President of the Parliament’s Lower House. Mara Carfagna, who will serve as Minister of Equality, and Giorgina Meloni, who will be in charge of Juvenile Policies, will be ministers without special designation. The previous moderate leftist government headed by Romano Prodi had six female ministers out of 25. Berlusconi scored a deserved point presenting the list of members in his cabinet to the press immediately after the meeting in which the president of the Republic, Giorgio Napolitano, passed to him the mandate to construct a new government. Monday I will join the Board of Ministers for the designation of sub secretaries, then on Tuesday we will have a debate about trust in the government in the Chamber (of Deputies, NDR) and Wednesday in the Senate, stated Berlusconi. After having received the support of Parliament –where the coalition of the People of Freedom (PDL) as well as the Northern League hold ample majorities– Berlusconi celebrated his first meeting with the Board of Ministers in Naples, the city stricken by the waste crisis. “The National Alliance has planned to combine with the Forza Italia in the PDL. The Northern League has refused to enter the PDL, although it continues in coalition with the conservative party” The communist veteran Napolitano seemed satisfied with the unusual quickness of the affair, which was owed, above all, to the simplification of the Italian political scene. It has gone from having 14 parties in Parliament (without counting splits and subgroups that have emerged within these) to only six. Napolitano proudly emphasized that, for the first time, Italy has advanced in proceedings more rapidly than Spain, where the new Government of José Luis Rodríguez Zapatero has delayed some days more than Italy in entering into active duties. The Berlusconians of the PDL, created to substitute the coalition Forza Italia (FI) with a new and more well organized party, assured that the next will be a constituent legislature which will aim to complete some of the most important reforms like the reduction in the number of parliament members, among others. The National Alliance has planned for the end of the year to join Forza Italia in the PDL. “Romano Prodi, pathetically abandoned, assured that sooner or later the positive aspects of his term will come to light” The Northern League, historically allied with Berlusconi, has refused to enter the PDL, although it continues in coalition with the conservative party. The Democratic Party (PD) did not hesitate to define the new government as a total disappointment, built on balances between parties, without personalities from the outside orfrom civil society, and with only four women–not out of twelve ministers, as Berlusconi had said, but 21. Its leader, Walter Veltroni, however, insisted on his disposition toward dialog in order to bring about the constitutional reforms the country needs. In addition, as he had announced previously, Veltroni was present this last weekend, closely following the ministers of the center-right and directing the opposition in Parliament. Roman Prodi, pathetically abandoned, for his part assured that sooner or later the positive aspects of his term that are today unappreciate will come to light. “The country needs at least ten years of coherent activity in order to cure its ailments and balance its accounts” Berlusconi, who assumes power for the third time after a thorough victory in the legislative elections of April 13th and 14th, will need to confront a series delicate issues right away. Among these are the grave crisis of the Alitalia airlines and the problem of the trash that floods Naples. However the truly grave problem is that of revitalizing the country’s economy. Past the rest of the challenges, economic policies will be what certify the success or failure of the Italian right. This week, the outgoing minister of Economy, Tommaso Padoa-Schioppa, warned that Italy is the most economically stagnant and indebted country in Europe, and therefore needs at least ten years of coherent activity in order to cure its ailments and balance its accounts. In an interview with Corriere della Sera, he assured that it would be impossible to confront the greatest difficulties facing the Italian economy if the fight is not continued against fiscal evasion. Even with all this, he stressed the registered improvement in the reduction of the public deficit. “The imbalance that started a sanctioning procedure of the EU in 2005 has been corrected in a credible and sustainable way” This means leaving the resuscitation room –though not the hospital sort— from which the country will be discharged when it balances the public accounts and lowers the public debt below 60 percent of the Gross Domestic Product (GDP), Padoa-Schioppa said. The European Commission just closed the proceedings which it open against Italy three years ago for an excess in deficit. To still be Minister in times like these is a great satisfaction, said Padoa-Schioppa. The decision was made after the budgetary deficit went under 3 percent of the GDP in 2007. Forecasts were made that it would continue like that in 2009 and 2009. According to European Commissioner of Economic and Monetary Affairs, Joaquín Almunia, not only has it been corrected, but in addition, structural measures are being taken to consolidate the improvement. Italy reduced its deficit from 3.4 percent of its GDP in 2006 to 1.9 percent in 2007, such that the imbalance that prompted EU sanctioning proceedings in 2005 has been corrected in a credible and sustainable manner. The reduction of the deficit is a result of the structural measures adopted by the Government, GDP growth in 2006, and the greater public revenue derived from increased tax bases. Nevertheless, the CE stressed that these results could have been better if it had not been for additional expenses like social transfers or investments of capital. It stated that Italy should still push improvements through in order to consolidate its fiscal system. Nevertheless, it was predicted that the public deficit would grow this year to 2.4 percent of the GDP, which will be added to one of the highest debts in Europe. Hopefully, this debt will be reduced until it reaches 103 percent of the GDP, which is still an enormous figure in its own right. The outgoing Government of Romano Prodi reduced the predictions of GDP growth for this year to 0.6 percent, compared to 1.5 percent in 2007. This reduction comes as the company Confindustria warns of the risk of zero growth. Berlusconi’s principal point of emphasis in his third term will be to set in motion the structural reforms that Italy needs to lift an economy that has only grown 1.4 percent annually in the last decade. Young people cannot find steady employment. Pensions and salaries have remained paltry against a galloping inflation. Many businesses have become obsolete and cannot compete with the dragons of Asian business. Productivity has stagnated for years and the labor market is overly rigid. In his campaign, Berlusconi recognized the need to free public services from the syndicates and to privatize state businesses in strategic sectors like transport and energy. He says that selling public goods could quickly bring 700 billion euros to the state coffers. Two thirds of these goods do not belong to the central government but rather to regional, provincial and local governments. Will Il Cavaliere make good on his promises this time? To be efficient, solutions, if they are politically viable, would have to be applied discriminately in the north, center, and south of the country because Italy is not one nation, but at least three. “Berlusconi’s majority been received as good news for the economy, as Italy is approaching a recession after having remained lower than its associates for at least a decade” It is difficult to find a more unequal country in all the EU. If we add to that the cancer of corruption and organized crime, the cocktail couldn’t be more explosive. At the head of the Ministry of Labor, Berlusconi has placed Maurizio Sacconi, whose capacity to negotiate with syndicates has been emphasized. Despite hard times, observers are convinced that this will be a tranquil legislature, with fewer confrontations between Government and opposition. Berlusconi and Veltroni are ready to understand one another, and it seems that Berlusconi has now set his sights on the Palacio del Quirinal in the central office, which is his obsession. Reuters’s Gavin Jones thinks that Berlusconi’s comfortable majority has been received as good news for the economy and specifically for the market, as Italy is approaching a recession after having been lower than its associates during at least a decade. Last month, the outgoing Government of Romano Prodi reduced its forecast for growth this year to 0.6 percent, while the Monetary Fund calculated that Italy would hardly realize half of that. 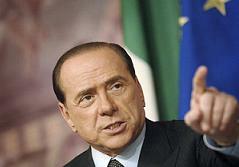 Some have seemed cautious about what Berlusconi will be able to do to breathe new life into the Italian economy. His last Government of 2001 to 2006 did not make good on its promises and did little in terms of economic reform, despite having a comfortable majority in both Houses, affirmed Susana Garcia of the Deutsche Bank. And that was even when he had a clearer, more ambitious plan than the current one, and a more favourable international economic stage. I think that Berlusconi’s real problem will be keeping his coalition united, said Gian Enrico Rusconi, professor of political science at Turin University. The Northern League is a protectionist party. I don’t think that Berlusconi is capable of pushing the necessary reforms through the legislature. “The security of the citizenry, the fight against illegal immigration, and state and fiscal reforms were the standards of the conservative electoral campaign” Political observers like Massimo Giannini of Repubblica or Massimo Franco of Corriere della Sera, reaffirmed today that Berlusconi has learned his lesson from the legislature of 2001-2006, in which he put in the first row the leaders of allied groups and ended up getting burnt in a permanent negotiation trying to contain them. Berlusconi, as he was so obligated, has passed around slices of power, although this time the largest piece (12 of the 21 ministers) went to for his own group. Four ministers went to the federalist Northern League, another four to the National Alliance, and the rest to a Christian Democrat that didn’t appreciate being rejected by Pier Ferdinando Casini of the UCD, which was an allied party until a few months ago. The security of the citizenry, the fight against illegal immigration, and state and fiscal reforms were the standards of the conservative electoral campaign. The new head of Government already announced that he does not promise miracles, but only the hard work necessary to resurrect the battered Italian economy, which has been dragging behind it a low growth rate, problems with competitiveness, and high inflation. “It is the only country in which, according to the Constitution, infrastructures of national interest (like those of transport or energy) form part of territorial competition” Tremonti will inherit a growing budgetary deficit and a rapidly deteriorating economy, which allows little margin for reducing taxes as the campaign had promised. Among his priorities is to make energy cheaper, a ‘tutto italiano’ handicap that decides all else. Until now we have delocalized labor. Why not now delocalize nuclear energy in order to localize labour? In a book written in 1992 with Giuseppe Vitaletti, entitled The Tools of Taxes, Berlusconi’s everlasting Minister of Economy maintained that in today’s world it is not necessary to conquer territory in order to gain wealth. today war is fought on the level of economic competition, and this new war makes it necessary to change the land in an attractive way. In Italy, on the other hand, the opposite has happened. It is the only country in which, according to the Constitution, infrastructures of national interest (like transport or energy) form part of territorial competition. In an interview with Alberto Orioli this last April, Tremonti said: on seeing Italy from far away, you perceive anomalies: the elevated public and energy debt, for which we pay 30 billion that leaves the country. Clearly, solar panels, windmills, and hydrogen function in specific contexts, but they are not enough. “With regards to global problems, Tremonti is thinking of a new Bretton Woods, a moment of enormous political symbolism for putting the global chaos in order” Between the current necessity and that of the eventual future, there is a gap that can only be filled with nuclear energy. Until now, we have delocalized labor, now we can delocalize nuclear energy in order to localize labour. If industry pays less for energy, it raises both its ability to compete and its productivity, which at the same time could be redistributed among the labor factor. In this way we could cut energy fees, which primarily need to be reduced in businesses and family homes. And what is the plan? To set up Italian head offices on the other shore of the Adriatic so that in exchange, part of the GDP will remain in the countries of origin. They would have greater technological difficulties in establishing head offices, but we know how to do it. This would specifically take place in Albania or Montenegro. With regards to global problems, Tremonti is thinking of a new Bretton Woods, a moment of enormous political symbolism for putting the global chaos in order. The new government has plenty of ministries without specific designation to be dedicated full time to the development of reforms, simplification of the administration, regional affairs, and programmatic success. Few governments in the world are permitted such a luxury. We will see if the deployment is justified and if Berlusconi redeems himself.